Home / Posts Tagged "potato"
Vermont Harvest of the Month (HOM) for November is kale! By now most people know how nutritious the ubiquitous cold season green is and how everybody should eat more of it. There are lots of great recipes for including kale in your everyday cooking – including a bunch of kid-friendly recipes HOM developed for Farm-to-School programs. easy – with only 3 ingredient and one pan it doesn’t get any simpler. great fall and early winter recipe I can make with all locally grown food! can be a main dish for a lighter meal or a satisfying side dish. Heat the oil in a large skillet over medium heat. Add the potatoes and fennel, season with ¾ teaspoon salt and ¼ teaspoon pepper, and cook, tossing occasionally, until golden and tender, 15 to 20 minutes. Add the kale and cook, tossing occasionally, until wilted, 8 to 10 minutes more. Serve with the hot sauce (optional). Growing up, beef stew was a staple in my mom’s cooking. I knew we were having it for dinner the moment I walked in the door. It’s one of those dishes that fills the house up with warm, comforting flavors. Often, she’d cook it in her slow cooker – allowing it to be a practical dish even on the busiest of weeknights. But it’s also perfect for weekend cooking or entertaining. And even if it’s just yourself you’re cooking for, you’ll get several dinners out of the stew, making it worthwhile at any time. Chuck roast, from the shoulder of the cow, is an ideal cut for stew. It’s economical and full of connective tissue that will break down during a slow cook and make the pieces of meat super tender. It’s just matter of cooking until the meat reaches that point of tenderness. Start with a 2-3 pound piece of chuck. Trim the outer layer of fat then cut into one inch cubes. Sear (brown) the meat in a large dutch oven or pot by heating a small amount of canola oil in the bottom of the pan over medium-high heat. For a good sear you will have to do a couple of batches. Just do one layer of meat at a time and be sure not to crowd the pan. Brown 2-3 minutes per side. You’re just looking to brown the meat, not cook it through at this point. When done, remove the meat from the pot. Add in another small splash of oil then the vegetables. Use 3 cups of your choice of sliced veggies. Onions and carrots are the standard. 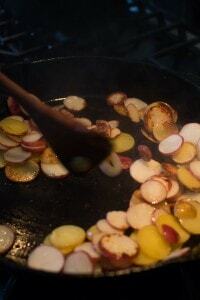 I add in potatoes and mushrooms if I have them, or roots like turnips and rutabaga. Your call. Just cook until browned and almost tender. Season with minced garlic, dried thyme, rosemary and a bay leaf. When done, return the meat to the pan. Now it’s time to deglaze the pot. That means scraping up the brown bits that have formed on the bottom of the pot with liquid. Red or white wine, cider or beer add some great flavor. But if you just have broth or even water – that will do the job. Just add the liquid in and gently scrape the pot with a wooden spoon. Add in the tomatoes, broth and extra liquid, if needed, to make sure everything is covered. Bring to a boil then reduce to a simmer and cover. Let the stew stew for about an hour before checking the tenderness of the meat. If still chewy, continue cooking, checking every 15 minutes until ready. If the stew looks too thin you can uncover the pot in the last 1/2 hour or so of cooking to let some of the liquid evaporate. Or, if you’d like to thicken it up even more, remove a cup of liquid from the pot and whisk in two tablespoons flour. When completely blended, stir back into the pot and cook another few minutes. If making in the slow cooker: Follow steps 1-4 as written, then transfer everything to the slow cooker. Cook on low 4-6 hours. Heat 2 Tbsp oil in a dutch oven or large pot over medium heat. Sear the chuck, in a single layer, in batches, without crowding 2-3 minutes per side. 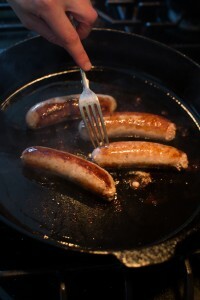 Remove from the pan when browned but not cooked through. 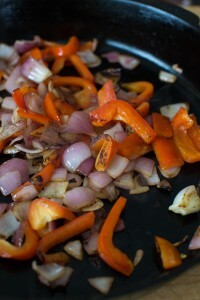 Add in the veggies with another tablespoon oil. Brown and cook until just slightly tender, 5 minutes. In the last couple minutes of cooking, add the garlic, thyme, rosemary and bay leaf. Return the meat to the pot and deglaze with your liquid of choice. Pour in the broth, and some water if needed, to cover everything in the pot with liquid. Bring a boil then reduce the heat to medium-low to bring the stew to a simmer. Cover and cook for about an hour. Check the tenderness of the meat. If not yet done, cover and continue cooking, checking every 15 minutes until to your liking. If you’d like to thicken the stew, remove a cup of the stew liquid and whisk in 2 tablespoons flour. Stir back into the pot and cook another 5 minutes. Taste, adding salt, if necessary, or a splash of apple cider vinegar, for some extra flavor. To serve, remove the bay leaf and top with the chopped parsley, if desired.